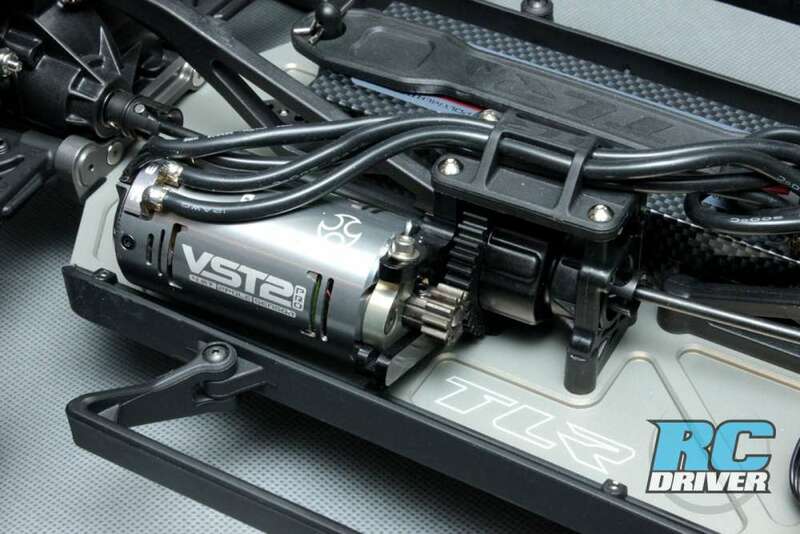 Team Losi Racing has been a dominant force in the short course racing scene and their TEN SCTE platform is now in its third version and some thought the amazing abilities of its predecessors couldn’t be topped. 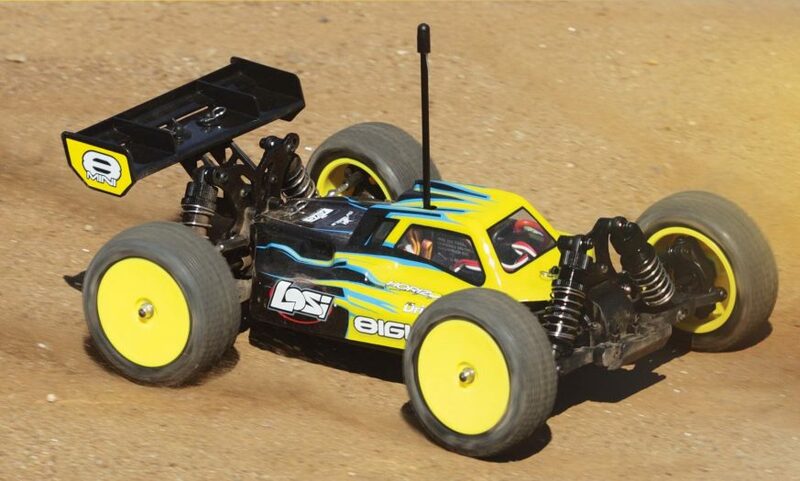 The Team Losi Racing TEN-SCTE 3.0 still retains the cues of the popular 8IGHT buggy championship winning design, but the design team has tweaked the 3.o in key areas to deliver even more promising performance. Exciting refinements like a new chassis with adjustable differential/ motor assembly position, new front arms and caster blocks, low friction center dogbones and use of TLR 22 lightweight shocks show promise of putting this popular race truck into the next level category. • Really? Version 3 and we still can’t get dimples on the body to match the truck? We’re on version three of the Team Losi Racing TEN-SCTE and the question on most racers minds is it worth buying the new kit. This is a tough question to answer because each version of the truck has been excellent. Heck, I know that a buddy of mine is still racing the Losi Ready To Run SCTE I lent him years ago. 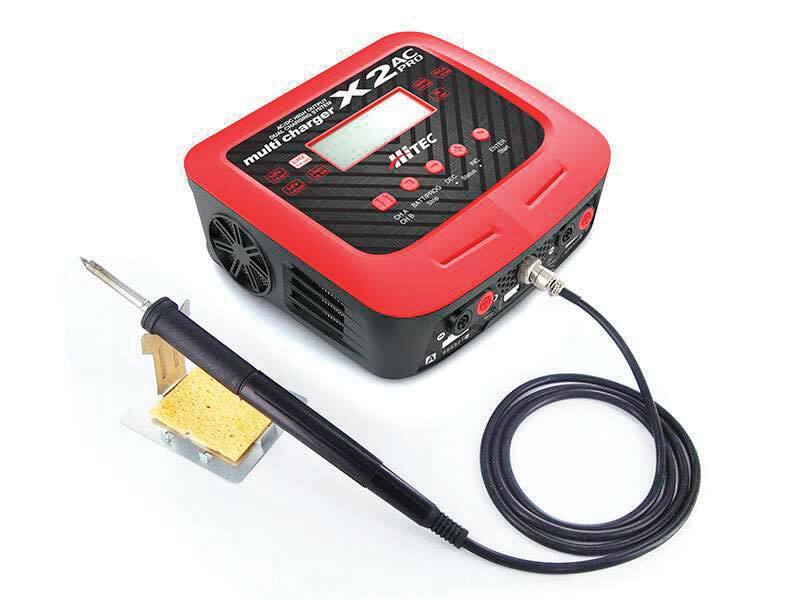 Do you need to shell out cash for the new machine? Well, yes. I believe there is enough noticeable improvement in the truck that warrants whipping out the credit card for a new truck. 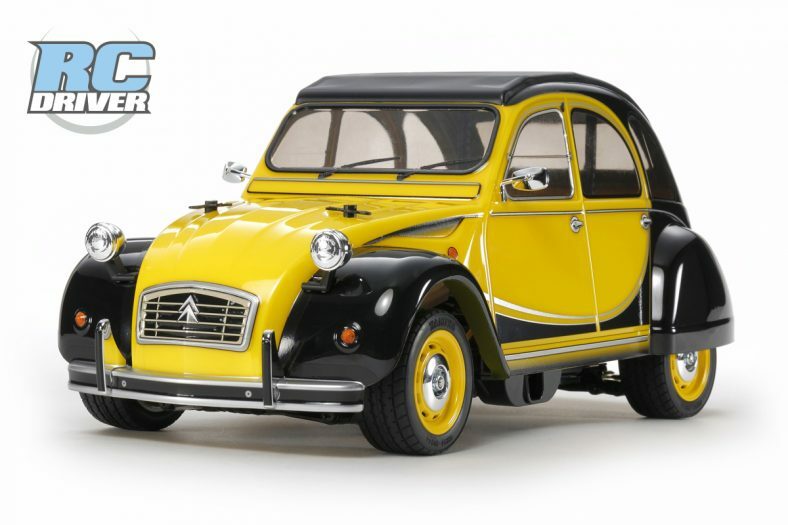 The handling is excellent, I’m impressed with the adjustability of the chassis for indoor or outdoor track use and the steering seems to be a major improvement. Know that when you do pick up the 3.0 that you can probably get a lot of use out of it, just like my buddy has done with my Losi SCTE. MOTOR/ DIFF MOUNT- The motor mount is integrated into the diff mount and is of course machined aluminum for strength and heat dissipation. The main mounting bracket is black anodized and the sliding motor mount bracket is anodized the signature TLR grey. Just a single screw secures the motor mount into the main mount after the gearmesh is set. Here you can also see the wire routing guide above the center differential that keeps the motor wires out of harms way. Behind the motor you can see the new center dogbones and lightweight outdrive cups that reduce friction in the drivetrain. 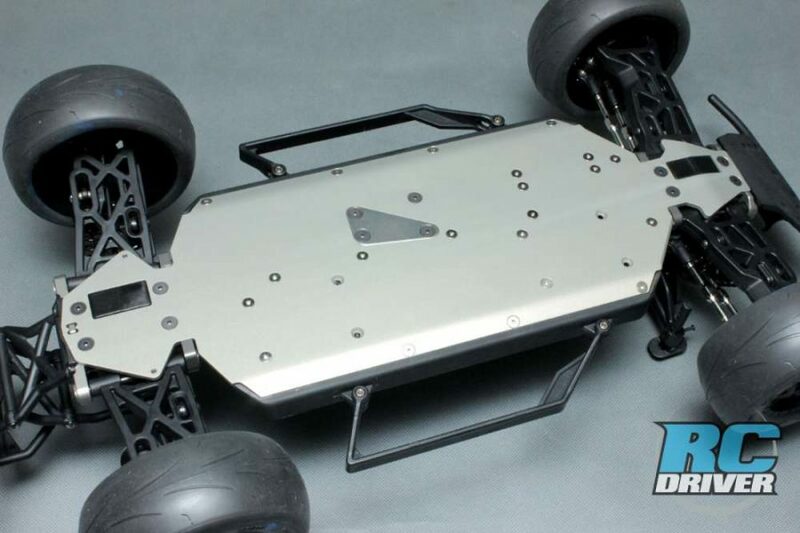 CHASSIS- Although the basic shape of the Team Losi Racing TEN-SCTE chassis looks like its predecessor, there is one glaring change and that is the silver triangle in the center. What is the mysterious triangle? 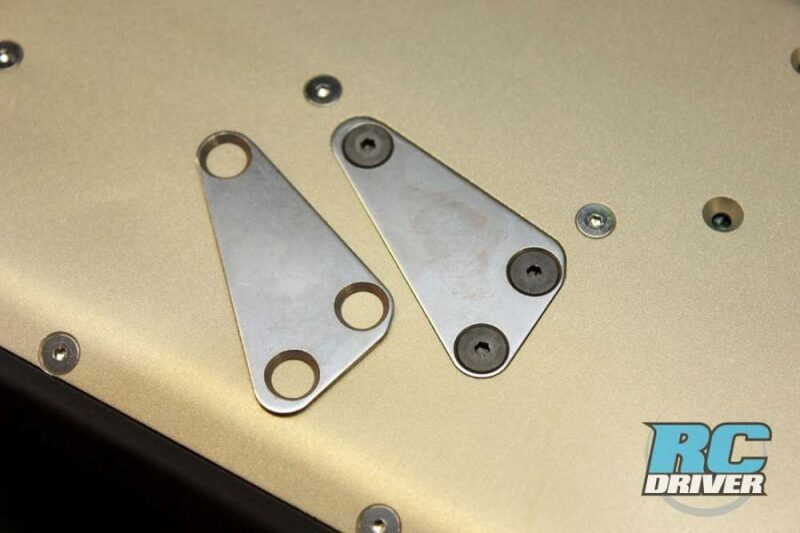 Its a stainless steel guide plate that adjusts the angle of the center differential assembly. Adjusting the angle of the assembly alters the “bleed” power distribution. TLR includes an additional plate in the tuning parts bag so you can use the plate that will distribute power evenly to the front and rear or the other plates lets you bleed power to the rear. But that is not the only change. The chassis is also slightly shorter making handling more nimble. STEERING- The steering assembly remains unchanged on the 3.0. The truck still utilizes the minimalist servo mount with “stick the ol’ receiver to it” radio set-up. The steering cranks have a built in servo saver and heavy-duty captured tie-rods feature light weight aluminum pivot balls. 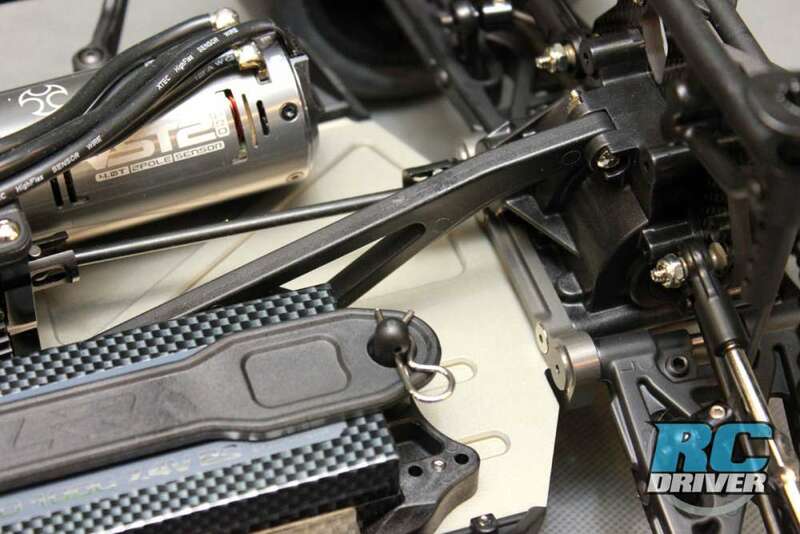 TLR provides and additional ackerman bar in the kits tuning parts bag as a tuning option. SHOCKS- TLR long travel 22-platform Gen II shocks now come fitted to the Team Losi Racing TEN-SCTE and some may be asking why since the previous TEN-SCTE shock was thought to be a great shock. The 22 shock actually has the same 16mm bore as the previous shock, so you’re not sacrificing volume size and the bore of the 22 shock is precision machnined. The benefits to the 22 style shock is that it has a thinner wall so the shock is lighter than a TEN shock. The other nice feature of the 22 shock is that it uses X-ring seals which have less friction and when used with the TiCN shock shafts have a much smoother feel. The 22 shocks also have CNC machined pistons, bleeder style shock caps and the appropriate TLR precision springs for rebound. 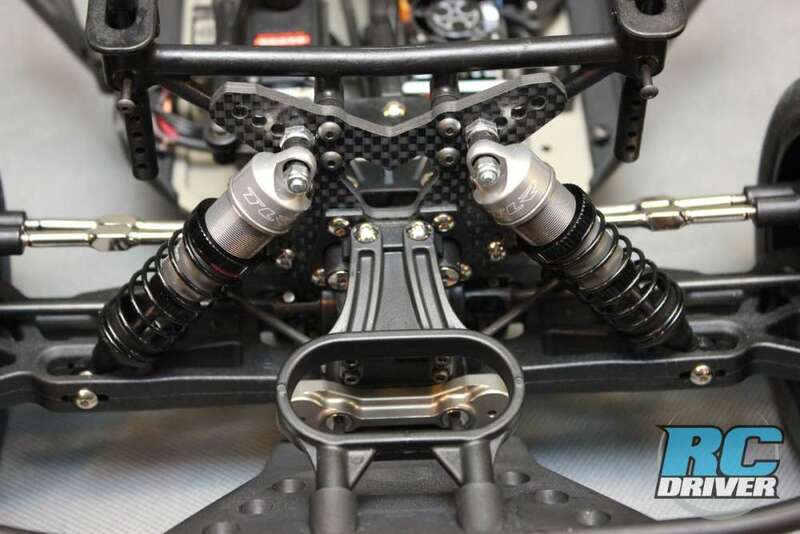 As you can see the shocks are mounted to lightweight 4mm thick carbon fiber shock towers with plenty of shock position holes. 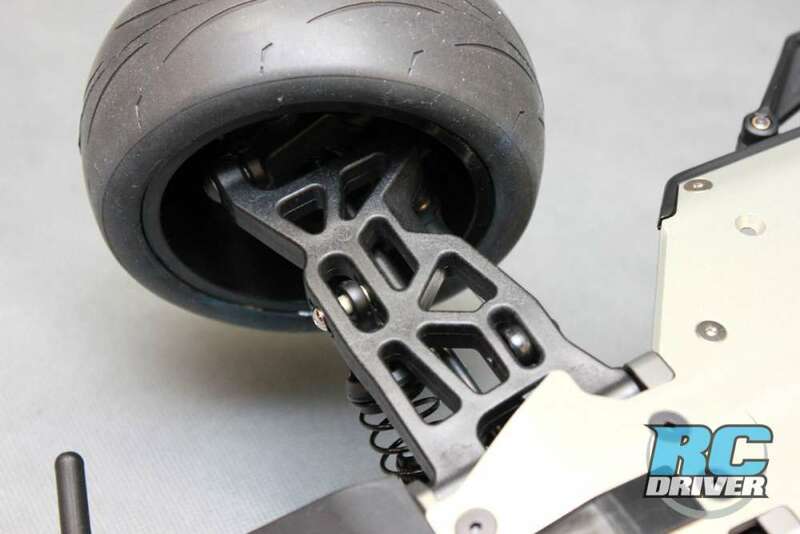 FRONT SUSPENSION- It may not be obvious at first glance, but TLR has developed new 15-degree composite plastic caster blocks for the 3.0. Previously drivers had been using the optional aluminum caster blocks to get the benifits of the 15-degree angle, but now the truck comes equipped with them to give the wheel a better angle while cornering for improved contact patch during cornering. The king-pins in the steering spindles are TiCN coated for smooth operation and large sealed ball bearing support the axles. Heavy-duty turnbuckles make camber and toe adjustments easy. 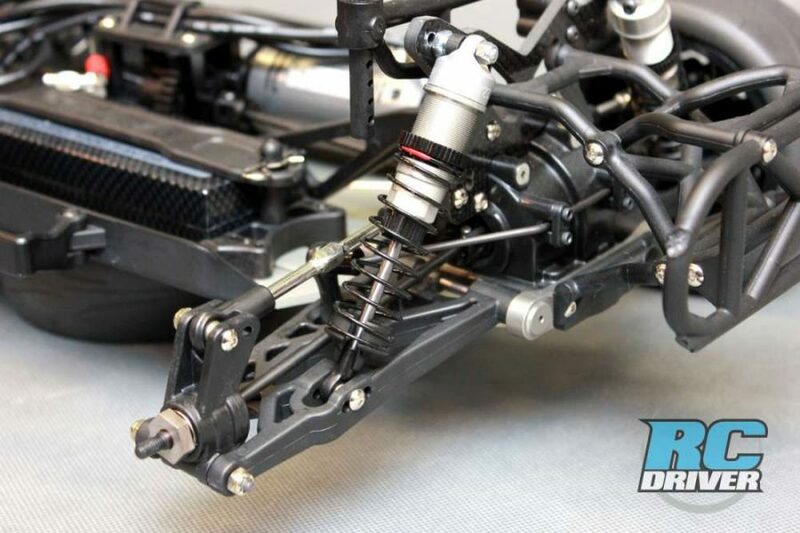 REAR SUSPENSION- Other than the addition of the 22 shocks, the rear of the 3.0 remains repetitively unchanged. However, that doesn’t mean its void of standout features. The wheel base can be adjusted at the rear hub via spacers on the double-nut retained suspension pins. 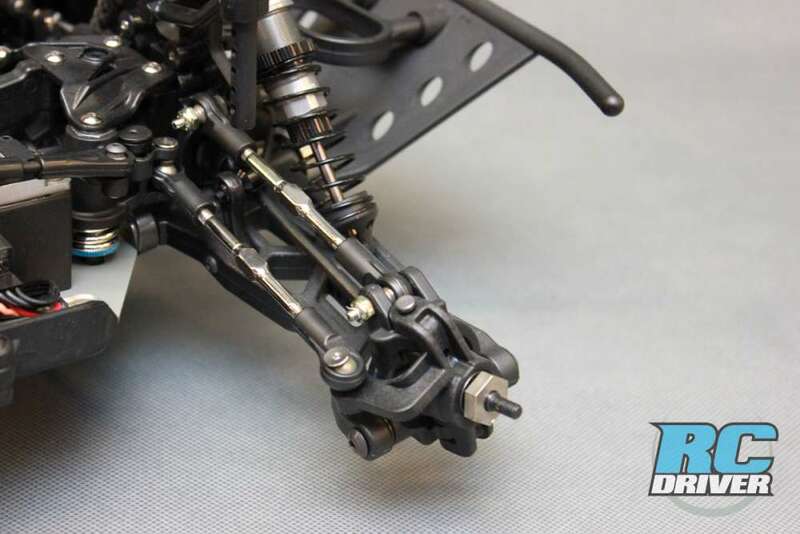 The rear arms have always been tough and feature three positions to tune shock angle and screws inboard to set droop. The only part we wished there was a revision of is the rear bumper. The kit still includes the wide SC style bumper that everyone cuts the outer body support hoops off of. TLR’s 22-SCT includes a cool square type rear race bumper and we would have liked to see it adapted to this truck. DETAILS- The inner hinge pins are supported by TLR aluminum pivot blocks with plastic inserts that allow you to use included optional inserts to adjust toe and anti-squat. We should also note that the inner pins are TiCN coated for smooth operation. Inside the diff case is a fluid filled gear differential that can be tuned by using optional oils inside. As you would expect, the driveline runs on full set of shielded ball bearings. CHASSIS INSERTS- Here is the cool tuning plates TLR developed to alter the position of the differential/ motor mount assembly. By moving the assembly via these plates on the Team Losi Racing TEN-SCTE you can alter the power bleed effect to the driveline. FRONT ARMS- Previously we mentioned the new caster blocks giving the wheels an improved angle when cornering. To take full advantage of the new wheel angle, TLR developed new arms that give proper clearance to the wheel at full lock and the wheel won’t scrub on the arm. The new arms have a nice solid feel to them for more precise handling yet, they are still durable. 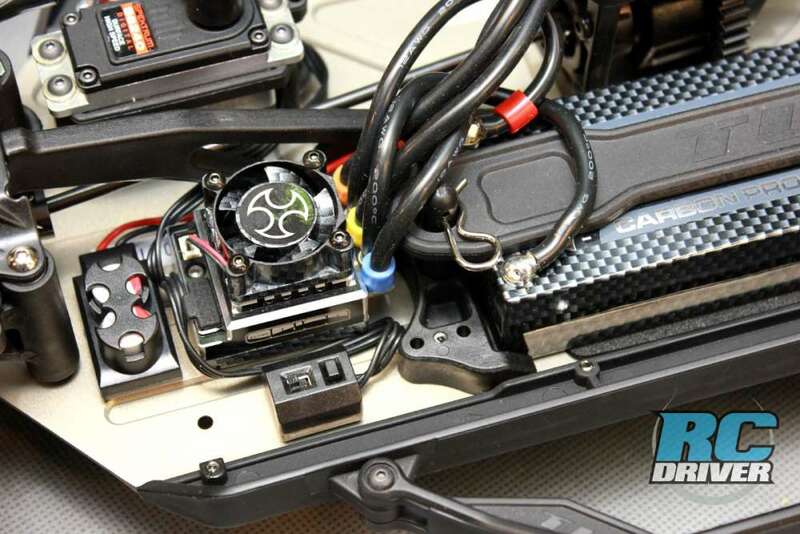 ADJUSTABILITY- Also noteworthy is the battery mount on the Team Losi Racing TEN-SCTE 3.0. The batteries position can be fine tuned in the truck to alter weight bias. 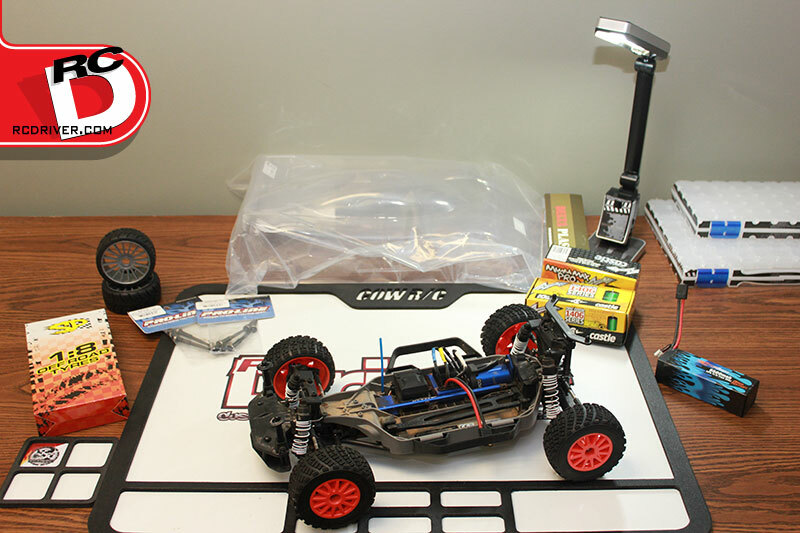 It can also be moved far forward or all the way back and the ESC mounted in front of it or behind it depending on the type of track you run on. We have our battery mounted towards the back for indoor use to help it rotate quickly and accelerate harder out of the turns. 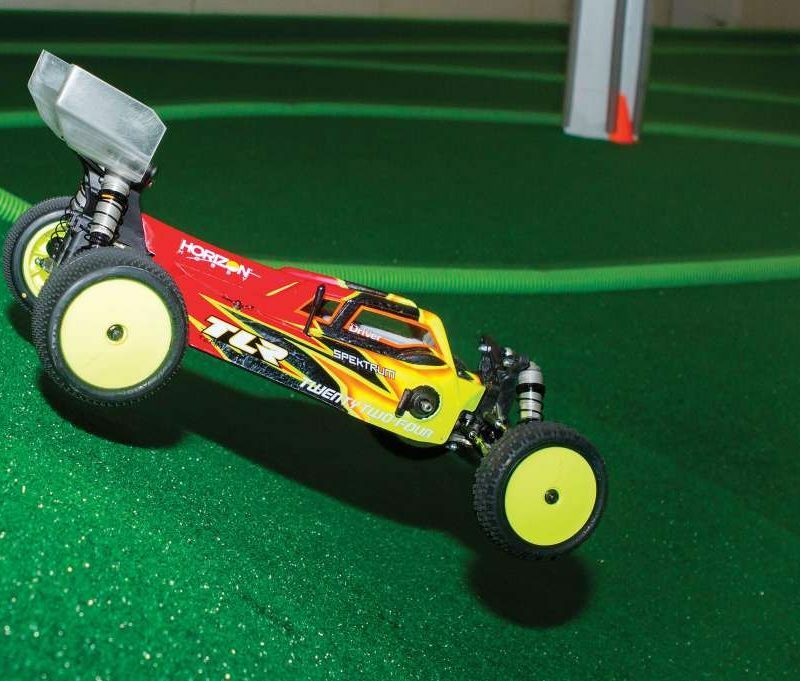 Testing took place at one of our favorite RC venues, Wolcott Hobby and Raceway in their indoor Waterbury CT location. It is the last remaining indoor dirt track in CT as others have converted to turf. STEERING- After being closed for an off day, the test track was cold during the winter test month and a cold track tends to be a slick track. However I was still able to get a great read on the trucks performance traits and the steering was noticeable improvement from what I recalled about the previous SCTE racer. As I noticed the truck leaning into the corners the tire appeared to have a good contact patch with the ground and the tire was biting into the dirt. The more planted front end feel along with the truck rotating smoothly and controllable made me feel much more comfortable behind the wheel. In the two large sweeping corners of the track, I could give the truck more throttle than I normally would and in the tighter corners, I was able to brake, dive into the corner, then hit the trigger hard to accelerate quickly out of the turn. ACCELERATION AND BRAKING- Punching the throttle on the straight resulted in instant Pro-Line Primes grabbing and incredible acceleration. 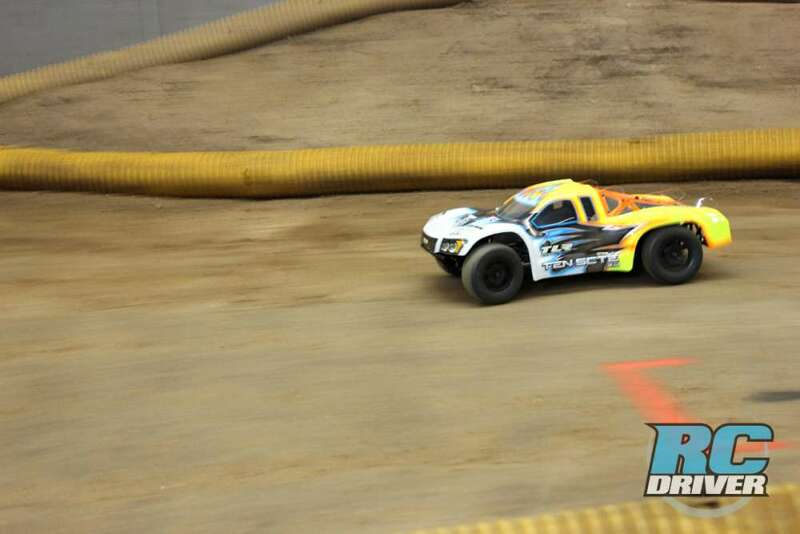 No doubt the Team Orion brushless system with 4.0T motor had something to do with the gobs of power, but the Team Losi Racing TEN-SCTE 3.0 gets the credit for being able to apply the power to the ground. The truck does seem a bit loud as the motor tops out and the gears whine, but there doesn’t seem to be any power loss in the drive. On the straights and out of the corners, this truck and electronic set-up had tons of punch. I like! Now braking was a bit hairy at first, at the end of the straight, I hit the brakes hard a few times before getting my braking points timed properly and a few of those practice laps sent the stuck sliding very wide in the corners, but once I got the hang out it, the truck slows up well without getting unsettled. I did mess with the brakes some more on the bench with the Team Orion program card to tame the brakes for correction on the jumps, the ESC has insane braking strength from the factory. 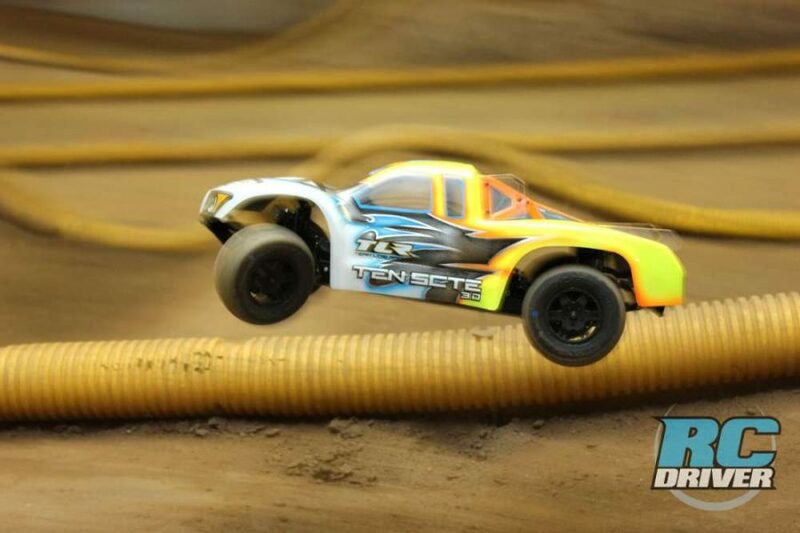 JUMPING AND HANDLING- I’ve heard drivers refer to the TEN-SCTE as a tank on the track and it just blasts through ruts and bumps without getting upset and the 3.0 is no different. 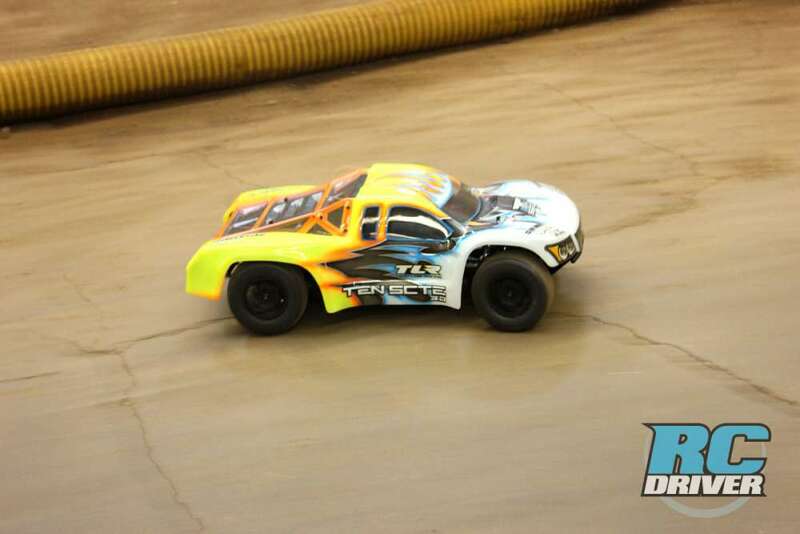 The test track consisted of compact clay and a few areas has broken up, even in corners, but the Team Losi Racing TEN-SCTE 3.0‘s suspension worked its magic to keep the chassis flat and laying down the power. A large tabletop jump in one of the tracks corners left the truck landing in an awkward position. But although it looked like the truck would possibly roll on each landing, the first front wheel would touch on landing and the SC would pull out of the dive and instantly level the front with the power guiding the truck into a full flat landing and I’d roll the power into full throttle. A little hard to explain, but basically the suspension was working overtime and had some impressive results. On the front straight was a double followed by a table top. At first I followed the usual flow with the double jump and table top pop-over, but then I got a little feisty and sent the 3.0 flying off the first jump of the double and landed on the table top. Editor Matt Maziarz just let out a “Whoa!” Not only did the truck fly far and land perfectly, but it was easy to adjust the attitude of the truck in the air with the throttle and steering. DURABILITY- So as you just read, I sent the 3.0 flying in the air turning two separate jumps into one big jump. Well there were a few less than pretty landings sending truck tumbling into the plywood wall at the end of the landings. There were some loud sounds echoing from the SC body but there was only one issue to report. 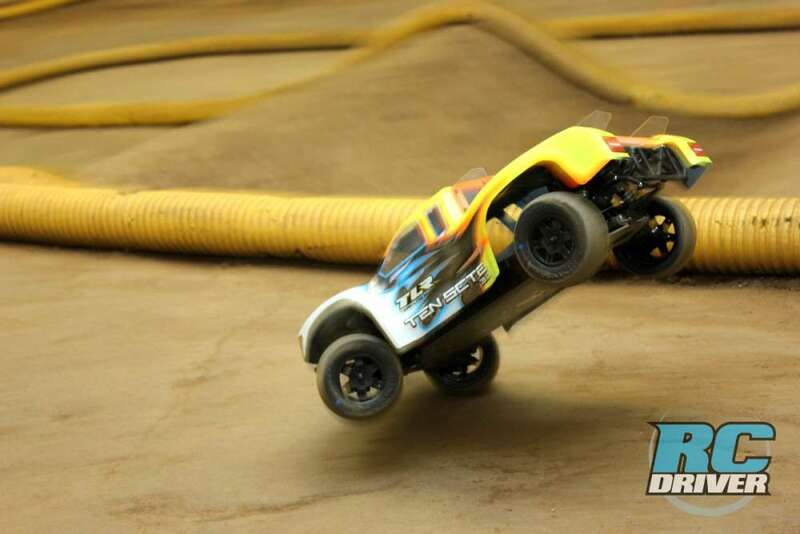 One landing was too short and I nosed the Team Losi Racing TEN-SCTE 3.0 into the face of the table top jump. To my surprise, it popped back up and landed on all four wheels. However, when I hit the throttle, all I heard was the motor spool up. The hard impact had completely moved the motor so there was no pinion/spur mesh. Back in the pits I re-positioned the motor and tightened it back down. Luckily no damage occurred to the spur. 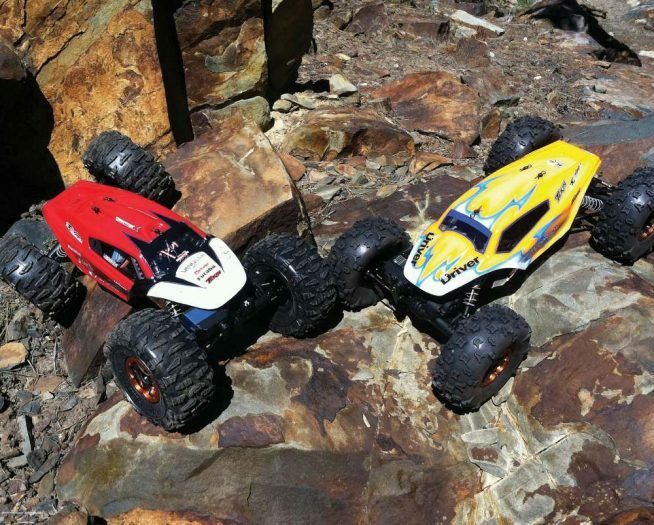 If you were drawn into reading this article by our posing question in the title: “Best 4WD Short Course Racer Ever?” and want to know the answer, here it is… In the line-up of TEN-SCTE’s, the 3.0 is the best. 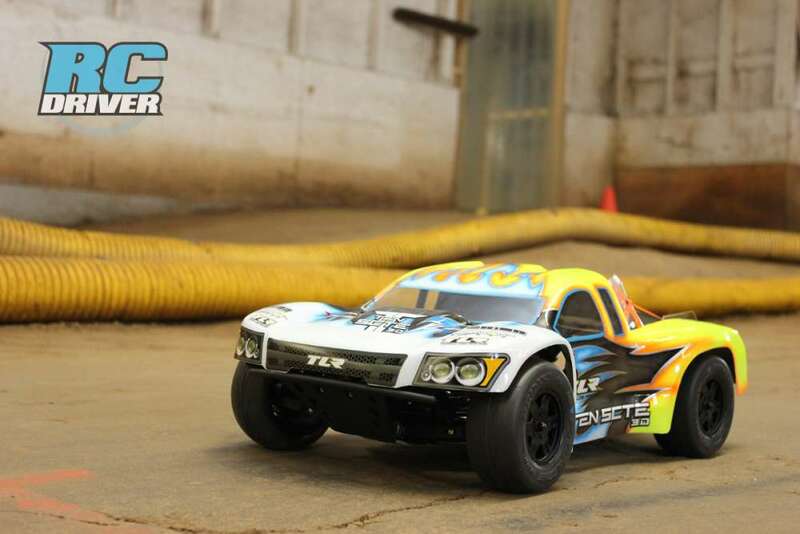 I have been a long time fan of the TEN-SCTE and I’m impressed with the quality and performance of this new 4wd SC racer. The build seemed to fly by quickly and easily. Tuning and maintenance is impressive. The truck proved to be durable on the track and my only gripes were listed in the “Meh” section above. But my two issue’s are nothing compared to the capability of the truck. 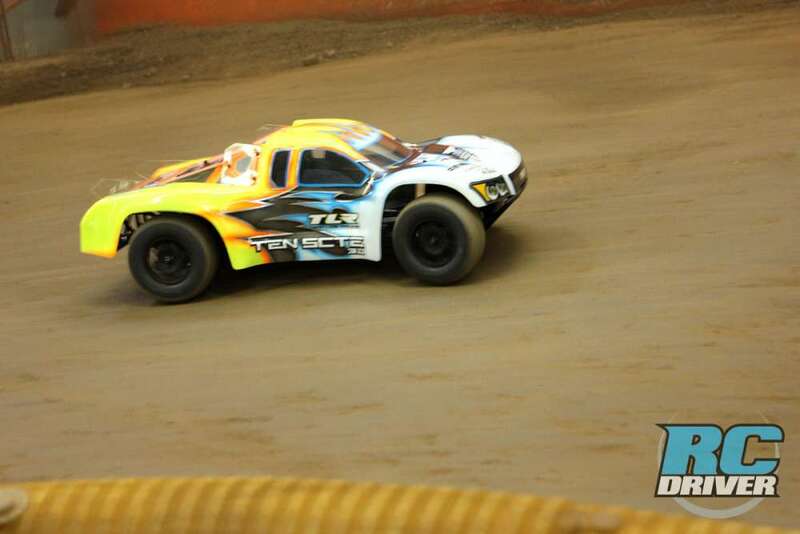 We gave the Team Losi Racing TEN-SCTE 3.0 some high scores in our rating tally and they are all deserved. 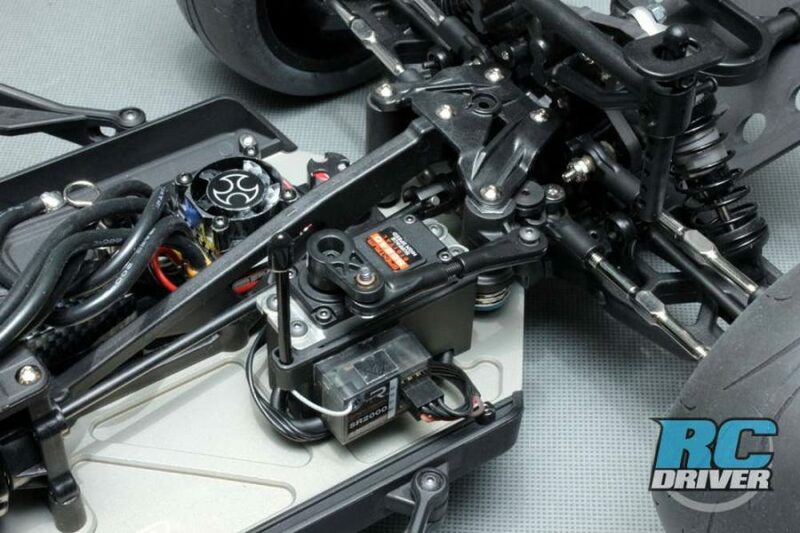 TLR refined the performance again on one of their championship winning designs and the results are outstanding.